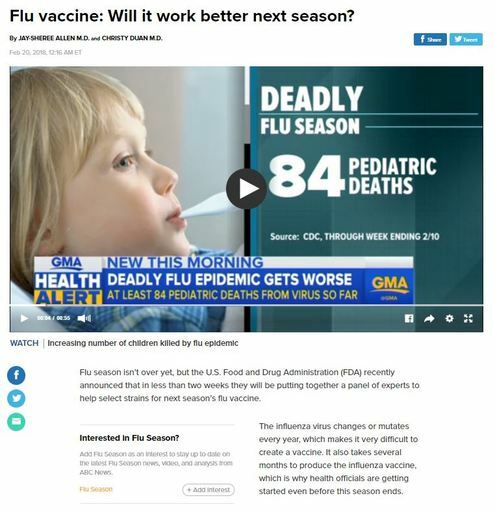 ABC News: ​Flu vaccine - Will it work better next season? Flu season isn’t over yet, but the U.S. Food and Drug Administration (FDA) recently announced that in less than two weeks they will be putting together a panel of experts to help select strains for next season’s flu vaccine. The influenza virus changes or mutates every year, which makes it very difficult to create a vaccine. It also takes several months to produce the influenza vaccine, which is why health officials are getting started even before this season ends. The effectiveness of the flu vaccine for H3N2 is estimated to be around 25 percent this season, according to an interim report by the Centers for Disease Control and Prevention (CDC). Overall, this season’s vaccine is 36 percent effective. That means that over one-third of the people who get the shot won’t get the flu. In children, it’s even more effective -- 59 percent. With vaccines against common childhood diseases effective in more than 90 percent of people, why is targeting the flu so difficult? Researchers have found that poor immune response, based on past encounters with flu strains, is the culprit. When people get the flu virus or vaccine, their immune system makes antibodies that recognize and attack those strains. Antibodies made earlier in life have a stronger response, and affect how the immune system makes future antibodies. A person’s immune response could be worse at making effective antibodies, even if the vaccine protects against the right strains. "We see that both vaccinated and unvaccinated people were infected with similar flu viruses and that the vaccine didn’t elicit a strong immune response from most people,” Dr. Yonatan Grad, Ph.D., assistant professor of immunology and infectious diseases at the Harvard T.H. Chan School of Public Health and co-author of the study, said in reference to his study analyzing 2012-2013 H3N2 data in a press release. The CDC admits that vaccine effectiveness estimates against influenza A (H3N2) viruses have been lower than estimates against influenza A (H1N1) and influenza B viruses for several years. They cite factors such as age, baseline health status and that year’s vaccine “match” -- the similarity between the viruses used to make the vaccine and the ones that are prevalent in a certain year. They also acknowledge that more research is needed to determine if vaccine effectiveness changes between egg-based and non–egg-based vaccines. It is thought that non-egg-based vaccines are less likely to have mutations that lead to less protective effects. However, the study authors conclude that egg-based vaccines did not explain the low H3N2 vaccine efficacy rate, at least not in 2012-2013. The leading health officials insist that even with current vaccine effectiveness estimates, vaccination will still help prevent influenza illness, including thousands of hospitalizations and deaths. Editor’s note: This story has been updated to clarify that Dr. Yonatan Grad's quote was in reference to 2012-2013.